On the way to a department lunch today I saw smoke in the sky so I decided to drive to it and this is what I found. 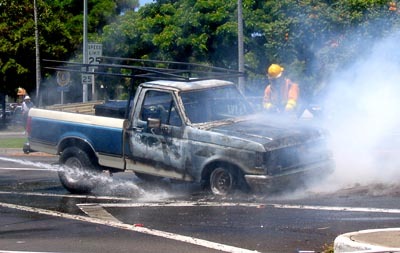 A bystander said the truck, which was stopped in traffic on Palani Road headed up to the Queen Kaahumanu Hwy, was smoking in traffic. The driver refused to get out of his truck, seems he didn’t believe it was a big deal despite smoke coming from under the hood and going into the cab. Finally firefighters had to haul the guy out then the truck burst into flames. By the time I got there the firefighters had just about finished hosing the thing down. Whenever you see a fire like this it’s best to not rubber-neck or get too close of a look because super-heated tires tend to explode and take with them any loose bits of fender as shrapnel. I’ve seen it happen before. 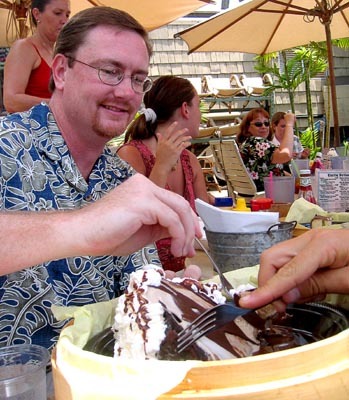 Here’s dessert from our lunch at Huggos on the Rocks, the Hualalai Mud Pie. 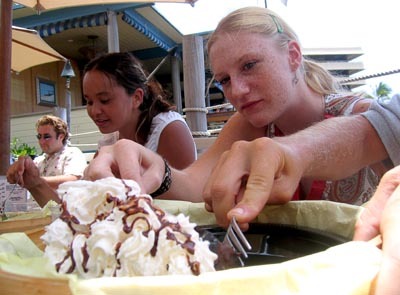 Some kind of mac nut/oreo type crust, coffee ice cream, fudge, chocolate, whipped cream and 1M calories. Ron digs into it as we shared it. Another view of the deconstruction of the mud pie by Andrea and that’s Travis’ fork on the right. I got my digs in too and it was very yummy.